Simpson Bay, St. Maarten (Friday, March 23, 2018) – Simpson Bay, St. Maarten – Just over a month following the opening of its Temporary Departure Pavilion, the Princess Juliana International Airport – SXM can now boast of the successful completion of its Temporary Arrival Pavilion. The experience will be sure to bring comfort to our arriving passengers, as they enter via the newly constructed pavilion. The new Arrival Pavilion has been constructed adjacent to the Departure Pavilion, which will once again centralize the traffic flow in the common public parking area. It is accessible at the C-gates bus parking area on the airside. The Arrival Pavilion is slated to become operational on Friday March 23, 2018. Though a temporary solution, passengers can expect more comfort and ease as they clear the immigration and customs process upon arrival to the island. The premises will also host the police (Alpha Team). According to the Management of the SXM Airport Projects, Planning and Systems department (PPS), the SXM Airport has ensured the facilities will also feature food and beverage, car rentals and VIP concessions. 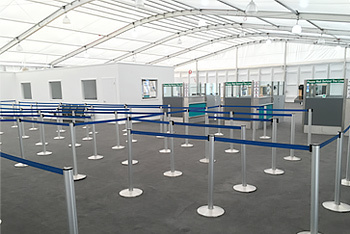 An area has been allocated for car rental concessions on the outskirts of the Arrival Pavilion on the airside, for added convenience of the arriving passenger. The dimensions of the pavilion are 25 meters x 30 meters and it is fully carpeted and air-conditioned. Currently the Princess Juliana International Airport – SXM has been utilizing its Fixed Based Operations (FBO) facilities for dual purposes following the passing of the destructive Hurricane Irma. The FBO is being used to facilitate the scheduled commercial flights and corporate jets. The opening of the new Arrival Pavilion will also signify that the corporate jet passengers will once again be processed exclusively in the FBO facilities. Passengers traveling with the major commercial flights like KLM, Delta, American Airlines and Jet Blue will be amongst some of the first to be processed within the facilities on Friday, March 23, 2018.